All Fleet Solutions offers more than a generic prep package or fuse panel. Our products support a wide array of installation techniques and an even wider array of equipment. Our team can assist in selecting the right power distribution, harness, and options for your installation to build a solution tailored to your fleet. Adaptable Design means there is no need to force a one-size fit all solution into your fleet. 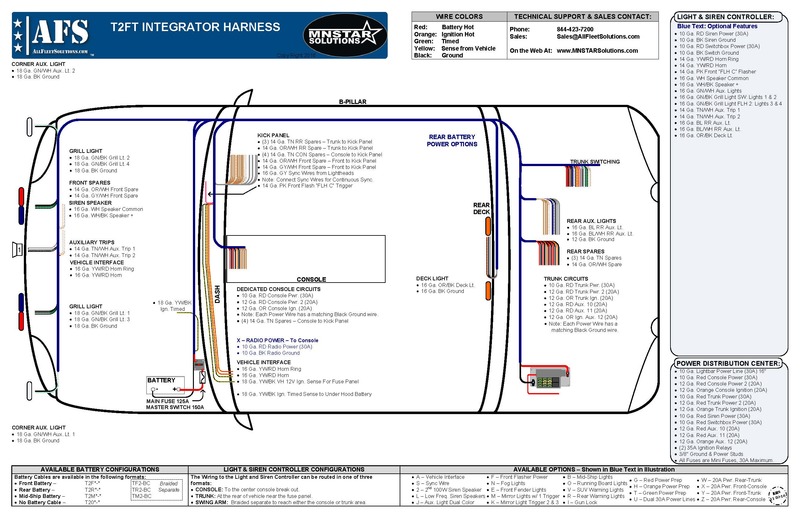 Our customers and installation providers are able to tailor each harness for each specific vehicle and equipment configuration. Power Prep Series: Power distribution solutions in a wide array of formats that support beacon lights, radios, computers, and full patrol vehicle installations. Simple solutions that include fuses, the distribution panel, power and ground lines. Installer Series: Installer products are designed to be light and flexible with power harnesses that are separate from lighting triggers. Select the options and power distribution to match to your installation. Integrator Series: Integrator products combine the power distribution and lighting triggers into a single electrical system. These fully braided harnesses offer the widest array of options and allow our customer to tailor the harness to their specific needs. Shop Supplies: If you are looking at this site you need them. If you do not see what you need, email us or click on the Blue ? in the lower right corner to send us a message. Not Sure which harness is right? We will walk you thru the steps to chose the right options. Use our layouts to determine where your equipment will go! The Harness Series determines the layout and braiding for the harness. The “T” Integrator and “P’ Plug and Play Series are available in both Level 1 and Level 2 configurations. 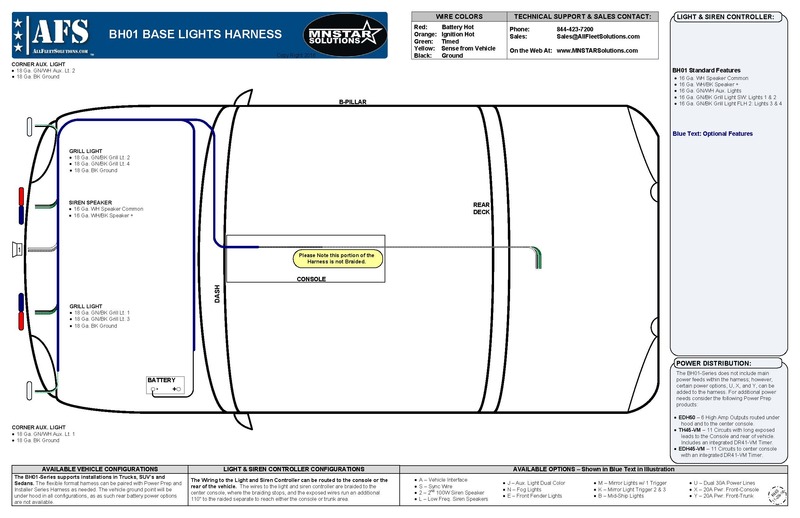 The Base Harness Series offers simple solutions to support vehicle lighting and warning systems. The Harness is braided under hood and to the center console, where braiding stops. The control wires run an additional 107″ and can be cut to length. AH-Series accessory harnesses can be utilized for lighting at the rear of the vehicle. 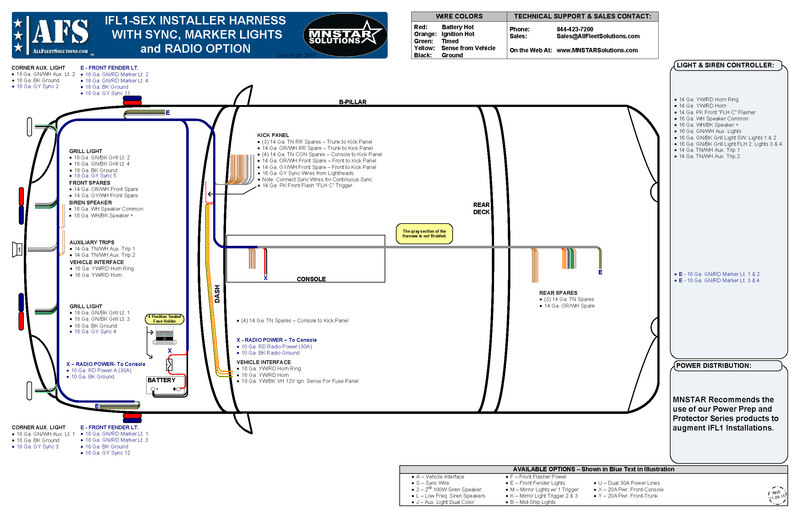 The Installer “IFL1″ Harness Series adds additional control wires, and spare circuits to the BH Series format. The Harness is braided under hood and to the center console, where braiding stops. The control wires run an additional 107” and can be cut to length. The Level 1 Integrator utilizes Power Prep Harnesses for the power distribution while offering a fully braided harness for the light and siren control wires. All T1 harnesses are braided as “Swing Arm” harnesses allowing the control wires to be routed to either the trunk or center console. The Level 2 Integrator provides a centralized Power Distribution Center with a fully braided harness for the light and siren control wires. T2 harness can be braided with the control wires routed to either the Center Console, Trunk or braided in the Swing Arm format. The T2 harness includes 12 primary fused outputs. 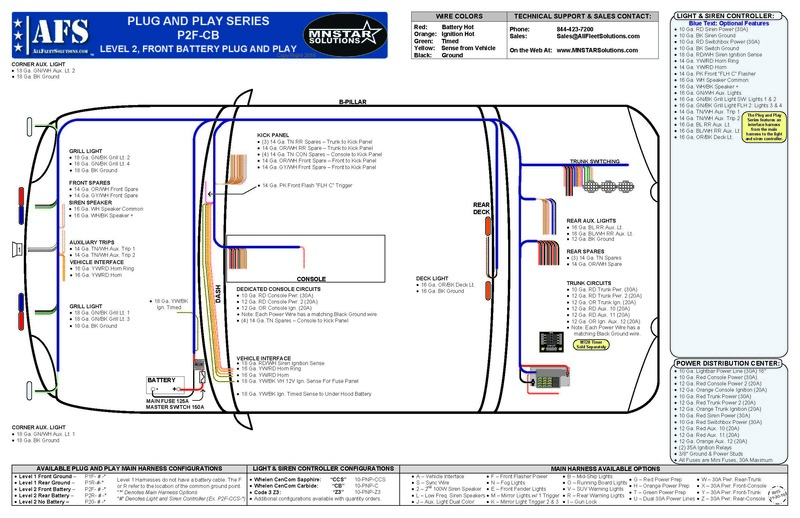 The Plug and Play Level 1 utilizes Power Prep Harnesses for the power distribution while offering a fully braided harness for the light and siren control wires. 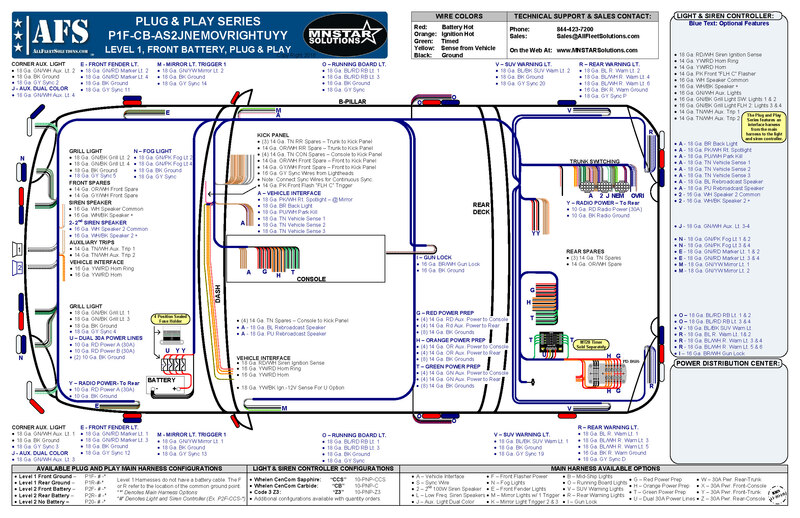 All P1 harnesses are braided for trunk mounted remote head light and siren controllers, and can be provide mating connectors to leading light and siren controllers. The Plug and Play Level 2 provides a centralized Power Distribution Center with a fully braided harness for the light and siren control wires. 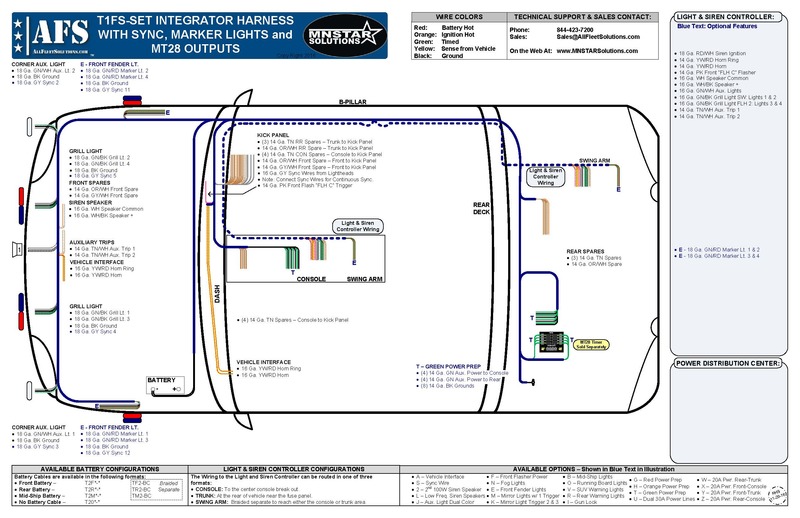 All P2 harnesses are braided for trunk mounted remote head light and siren controllers, and can be provide mating connectors to leading light and siren controllers. The P2 harness includes 12 primary fused outputs. The ICAN Level 1 utilizes Power Prep Harnesses for the power distribution while offering a fully braided harness for the light and siren control wires. All ICAN1 harnesses are braided for a trunk mounted Whelen CanTrol light and siren controller. The construction of the ICAN harnesses are unique to the capabilities of the Whelen CanTrol. The ICAN Plug and Play Level 2 provides a centralized Power Distribution Center with a fully braided harness for the light and siren control wires. All ICAN2 harnesses are braided for a trunk mounted Whelen CanTrol light and siren controller. The construction of the ICAN harnesses are unique to the capabilities of the Whelen CanTrol. The ICAN2 harness includes 12 primary fused outputs.